Five-year-old Lotepi Lokusi's mother was worried. Although she knew it was common for a Guinea worm to emerge from a foot or an ankle, she had never seen one migrate to the face. Clearly visible just under his skin--from one jaw line to the other--a Guinea worm was winding its way higher each day, toward her little boy's scalp. But she knew she could find help at the Guinea worm case containment center operated by the Southern Sudan Guinea Worm Eradication Program, with Carter Center's assistance, in Kapoeta North County, Southern Sudan. Jennifer Burnett, the Carter Center's technical advisor to the Southern Sudan Guinea Worm Eradication Program in the region, recalls the early June day she went to Lotepi's village. "When I arrived in Nawoyagilae, Lotepi's mother was particularly concerned and anxious to have her son treated at the local 'Guinea worm hospital,'" she said. "At the time, it was hard to discern whether it was a single Guinea worm running from one side of the child's jaw--under the chin and up the other side of his face--or whether it was two worms." Once Lotepi arrived at the case containment center, the Guinea worm migrated to the left side of his head, to the top of his skull. "As time progressed and the worm moved," Burnett said, "it became clear it was a single worm." Coaxing the worm to come out, and finally extracting it, were not easy tasks. "The nurse carefully made an incision to relieve the pressure Lotepi was experiencing and to release the infection," she said. "After his wound was drained, staff administered 'controlled emersion'--wet cotton compresses--several times each day, to coerce the worm out. Each emersion lasted one to two hours." Six weeks after Lotepi arrived, the stubborn worm finally emerged from his scalp and the extraction process--slowly rolling the worm onto a Guinea worm stick--began. 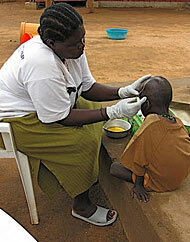 Nurse Antonella Lomong'o took Lotepi under her wing, diligently dressing his wound three times each day. "Each bandaging included a piece of gauze with tetracycline ointment applied over the worm, followed by wet gauze, dry gauze, and then taping," Burnett said. "The nurses shaved the area around the wound to reduce any pain Lotepi might experience upon removing the bandaging and placed padding underneath the stick." Lotepi showed amazing courage throughout the ordeal. "He was a wonderful patient," Burnett said. "He sat patiently during each bandaging. He would tell Antonella to continue to pull the worm if it was not paining him, and informed her when he felt pain and she needed to stop. I am happy to report that, besides the pain he felt when pulling the worm became difficult, Lotepi had no general pain during the removal of the worm." On July 29, the worm--in one piece--was removed from Lotepi's head. The lesion from which it emerged remained small, Burnett said, and did not become infected. "Lotepi is doing well. But he still has a hanging worm in his left ankle--the third worm he has endured this year--and will be staying here until he is fully healed," Burnett said. 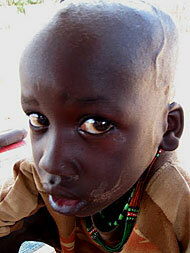 Although Lotepi's case is unusual, the level of care he received from the Guinea worm case containment center is not. "I find Lotepi's case motivating and inspiring," Burnett said. "I think it also gives a unique personal dimension to the work of the new case containment centers in Eastern Equatoria State. Without the case containment center in Kapoeta North County, I question that Lotepi would have received such high quality of care or been able to have a worm removed from his head with such little pain." Fewer than 5,000 cases of Guinea worm disease remain in the world, and most are in Eastern Equitoria state (where the Kapoeta North County case containment center is located), Southern Sudan, where lack of infrastructure and civil war hindered disease prevention efforts for decades. But cases have been reducing dramatically since the 2005 peace agreement between north and south Sudan, which opened the door for health workers to access this large area and put in place new interventions that are speeding the Carter Center-led effort to make Guinea worm the second disease to be eradicated from Earth. Five-year-old Lotepi Lokusi, shown with a Guinea worm winding its way from his jaw line to his scalp--just under the skin--received help from the Kapoeta North Guinea Worm Case Containment Center in Southern Sudan. The Carter Center provides technical and financial assistance to the country's Guinea Worm Eradication Program, which operates the containment center. Containment center nurses and field staff perform controlled emersion--application of wet cotton compresses--to coax the worm from Lotepi's scalp. The sessions, which lasted one to two hours, were conducted several times each day. 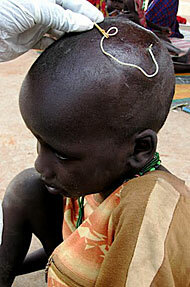 The Guinea worm emerges from Lotepi's scalp and is wrapped around a stick. After nine days, with the aid of the case containment center staff, this worm was successfully removed in its entirety. Nurse Antonella Lomong'o painstakingly bandages Lotepi's wound, a process she repeated three times each day.